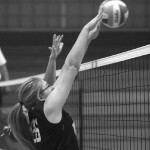 The Lady Tigers were defeated by Kingston in four games, 25-19, 23-25, 9-25 and 18-25, on October 6. For CPS, Kylie Smith 15 points, 6 aces, 1 kill; Cindy Alexander 11 points, 2 aces, 3 kills; Liz Welsh 11 points, 1 ace, 2 kills; Natasha Kandall 3 points, 1 ace, 7 kills, 7 assists; and Lindsey Hadd with 3 points, 1 ace and 2 kills. The JV girls took the loss, 27-25, 19-25 and 13-15. For the Tigers, Hannah Wrubel 9 points, 4 aces, 5 kills; Makenna Lindley with 6 points, 3 aces , 10 assists; and Maria Welsh with 5 points, 1 kill. On October 13, the JV and Varsity were defeated by Mayville. For the varsity, scores were 19-25, 22-25, 19-25. For the Tigers, Natasha Kandall 7 points, 9 kills, 5 assists; Kylie Smith 6 points, 2 aces; Cindy Alexander 6 points, 2 kills; Liz Welsh 5 oints, 5 kills; Rebecca Willet 5 points, 1 ace, 1 kill. For the JV, scores were 25-13, 13-25, 16-18. MacKenzie Falls 14 points, 8 aces, 2 kills; Makenna Lindley 8 points, 4 aces, 2 kills, 7 assists; Hannah Wrobel 4 points, 2 aces, 1 kill; Lilly Lentz 4 points, 1 ace, 2 kills. The varsity girls were defeated by Caseville, 19-25, 14-25 and 14-25. For the Tigers, Jenna Davis with 7 points, 4 aces; Cindy Alexander with 6 points and 2 kills; Liz Welsh 4 points, 2 aces and 4 kills; and Lindsey Hadd with 5 kills and 1 block. The JV lost in three, 23-25, 20-25 and 10-15. For CPS, Faith Ritz with 6 points, 4 aces and 2 kills; MacKenzie Falls with 6 points, 3 aces and 3 kills; Hannah Wrobel and Lilly Lentz with 5 points each; and Lilly Lentz, Makenna Lindley and Maria Welsh with 4 kills each.